This paper cut image was a gift to JoAnn from one of her teachers in Taiwan. 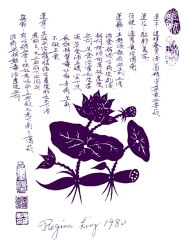 The image is that of a lotus plant, used in Chinese medicine. The characters describe its uses. JoAnn Simon, Lic. Ac., M.S., R.D. 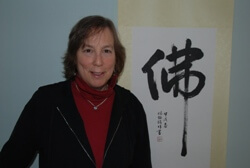 JoAnn graduated from the New England School of Acupuncture in 1979 and spent the next 3 ½ years in Taiwan refining her craft. She apprenticed with several acupuncturists there and studied at the China Medical College and its affiliated hospital. There she learned the art of Chinese Herbal Medicine as well as continued her acupuncture education. In addition, she studied herbal medicine privately with professors from the China Medical College. She returned to the Boston area in 1983 and has been practicing continuously since then. In 1985, JoAnn returned to school and earned a master’s degree in Food Science and Nutrition. She is a registered licensed dietitian and has been providing nutrition services to her clients since 1989. JoAnn provides these services in her private practice based in Littleton and Wayland, MA. She also sees clients at the Healing Garden in Harvard and works with veterans through Veterans Acupuncture Care (VAC) Metrowest.